Individual lives can effect change in the face of seemingly insurmountable obstacles. How does Ai Weiwei’s work merge the role of artist and political activist? How does censorship affect what the media reports and what citizens learn? BIG IDEAS Anywhere educators: View F Grass Guided Tour Video MUTE ON and encourage students to explore at different angles individually and in groups. • View Guided Tour Video: View F Grass Guided Tour Video again with SOUND ON. 1/ Using a KWL worksheet, ask students if they have ever heard of the artist Ai Weiwei and to write down what they know about him. 2/ View Sept, 2013 CBC National Canadian broadcast exclusive (13:14 minutes) as an introduction to Ai Weiwei as a person, his work, and his politics and discuss what new information they just learned. • Ai Weiwei’s Early Life, Communism & The Cultural Revolution – What are some of the causes and consequences of the Cultural Revolution in China? How did the artist’s early years and experiences shape his perspective of the Chinese government and his approach to art making? 1/ Artist’s Early Life: Watch a 2-minute segment from Ai Weiwei Never Sorry [from 1:12:30 to 1:14:00] on how Ai Weiwei’s father, the famous poet Ai Qing, was treated during the Cultural Revolution. Students to reflect on why they think Ai Weiwei’s father was treated that way. 3/ Differing Perspectives of the Cultural Revolution: After reviewing previous session, watch the video (14 min.) or read the article (CBS News, “The Legacy of Mao Zedong”), covering the rise of the communists to the controversy over the Beijing Olympics. 4/ Themes of the Cultural Revolution: Group students according to their interest to investigate one of the following: Government Leaders; The Red Guards; Re-Education Camps; Targets & Tactics; Communism & Mao’s Little Red Book; Resistance. Each group to share and present their consolidated findings using their choice of a presentation tool such as Animoto to the class. (Educators can get a free Animoto account Here). 5/ Introduce/revisit the concept of Cause and Consequence and/or view the following Cause and Consequence Video. Each group can complete the Cause & Consequence Worksheet (PDF) and answer these final questions regarding the multiple causes and consequences of the Cultural Revolution: What were some of the immediate consequences of the Cultural Revolution? What were some long-term consequences of the Cultural Revolution? What significance does the event have in China today? 6/ Watch the first minute of Ai Weiwei: Life is in danger every day video where Ai Weiwei speaks about the influence of his father on his life and work. Do you think Ai Weiwei’s experience of the Cultural Revolution might have influenced his approach to art making? Why? Why not? • Artist Themes: Ai Weiwei’s Adult Life, Challenging Authority through Art– How does Ai Weiwei’s work merge the role of artist and political activist? 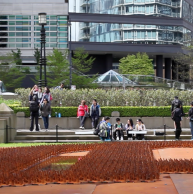 How does Ai Weiwei challenge the Chinese government’s authority through his artwork? “Typical Chinese critics are mild but skillful. They don’t directly criticize the Communist Party or government. In groups, students select and research one or several of Ai Weiwei’s artworks (see listed sample options). Treating it as a piece of Historical Evidence you think is the intended audience? What was going on in China at the time that this art was created that might help us interpret it? What materials has Ai Weiwei used? Is there special significance to these materials? Does this work challenge government authority? If yes, what symbols or metaphors does Ai Weiwei use to accomplish this? 2/ By using Aurasma on their posters the classroom can be transformed into an augmented reality museum. Using these posters, students stage and exhibition of Ai Weiwei’s work for their peers, teachers, administrators and parents. This short YouTube clip shows you how to use Aurasma. Here is what Aurasma looks like at the Grammy Museum. • Protest & Human Rights in China: Analyzing the Causes & Consequences of the Tiananmen Square Massacre – What were the causes & consequences of the Tiananmen Square massacre? Should the Tiananmen Square Protests be remembered as a justified social movement for democratic reform or the military defending the nation against violent counter-revolutionary elements? Note: Ai Weiwei was living in New York when the Tiananmen Square Massacre occurred in the documentary Ai Weiwei Never Sorry and he explains the effect it had on him. 1/ Watch the BBC News clip of the events occurring during the night of June 3-4, 1989 and solicit student reaction to the video. Explain that the aim of this inquiry is to uncover the sequence of events that caused the events of June 3-4 1989, known as the Beijing Massacre, the Tiananmen Square Massacre or the Six Four Incident. 3/ Classroom discussion: What is the significance (historical, social, cultural) of the geographical placement of Tiananmen Square in Beijing? 4/ Introduce/revisit the concept of Cause and Consequence and/or view the following Cause and Consequence Video. 5/ Group analysis delving into the sequence of events of the Tiananmen Square massacre and ranking them according to their perceived influence for presentation to the class (using a digital timeline generator like Capzles* or larges sheets of paper). 6/ Groups might also answer the following questions as part of their presentation to the class: What do you think were some of the short-term and long-term consequences of the Tiananmen Square Massacre? Were there any unintended consequences? If so, what were they? How might this event have been prevented? What significance does the event have in China today? 7/ Class discussion: The Chinese Government later claimed that violence began as a result of a minority of demonstrators attacking the troops. Do you think this is accurate? Why are exact casualty numbers unknown? Why is there such a difference between estimates? • Protest & Human Rights in China: Investigating Evidence, “Tank Man” & the Tiananmen Square Massacre – What is the historical value of the pictures and footage from the Tiananmen Square Massacre? 2/ Introduce/revisit the concept of Historical Evidence and/or view the following video on Evidence and Interpretation. 3/ Group research on the video: When was this video taken? Where was it taken? Who was the videographer? What was going on in China when the video was taken that might help us interpret it? What things capture your attention in this video? Why do you think this video was taken? 4/ Class discussion of the results of the group research. 5/ Teacher introduces these three final questions for groups to work through and share: Does this man’s courage represent a student movement defeated or resolved? These pictures, along with others of the massacre, were beamed around the world. How, do you think, people reacted to them? What is the historical value of these pictures and footage? Are these images available for Chinese citizens to view on the Internet today? Why or why not? • Freedom in China Today: Part I: Human Rights – How are human rights at risk in nations ruled by communist regimes? 1/ Think, Pair, Share Activity on the topic of human rights.What does the term ‘human rights’ mean to you? How do you define ‘human rights’? What do you think your ‘human rights’ are? 2/ Groups examine the Universal Declaration of Human Rights and consider making alterations to their original definition. 3/ Groups look at the Sections of the Canadian Charter of Rights and Freedoms and inquire into the following question: Is Canada abiding by the Universal Declaration of Human Rights? Do human rights violations occur in Canada? What happens when they do? 4/ Students review the website Human Rights in China (HRIC) and examine the following question: Is China abiding by the Universal Declaration of Human Rights? Do human rights violations occur in China? What happens when they do? 6/ Group Discussion: Why is it easier to get away with human rights violations in nations ruled by communist governments than it is by nations ruled by democratic governments? • Freedom in China Today: Part II: Censorship of the Press– How censorship affects what the media reports and what citizens learn? How is Media “Free” or “Not Free”? 1/ Students inquire: What websites are blocked in your school? Why are these websites blocked? Do you agree or disagree with this? Why would a government want to block information? Is there a difference between monitoring information and blocking information? Use a Canadian search engine such as www.google.com and enter “Tiananmen Square”. Each group is to record answers to the following questions:How many links can be accessed by this search? Scan through the first three sites. What seems to be the content of these links? What words are repeated? Use a simulated Chinese search engine such as Google-China’s website www.google.cn. (Chinese characters may be displayed as squares) and enter “Tiananmen Square” in the search box. Each group is to answer the following questions: How many links can be accessed by this one search? Scan through the first three sites. What seems to be the content of these sites? What words pop up? What sites pop up when using Google-China? Group discussion: How does the content of these search pages differ? Why do you think the content differs? 1/ Class begins with an investigation into China’s Freedom of the Press Rating by the non-profit organization Freedom House. 2/ Class discussion on factors that contribute to this rating. 3/ Students investigate the following questions: What make the press “free.”? What is the relationship between political freedom and a free press? 4/ Students examine the Freedom House Map of Freedom of the Press and inquire into other countries that do not have a free press. 5/ Introduce the class to The Empirical Analysis of Internet Filtering in China Study*. Group inquiry into the following questions:Why do you think the Chinese government restricted and continues to restrict access to some sites pertaining to “equality,” “democracy” or “dissidents”? What other terms do you think the Chinese government would censor? Why? Are there any search terms that the Canadian government might monitor or censor? Identify these terms and explain. Is a censored Google in China better than no Google? Explain. 7/ Groups are tasked with blackening out words in the BBC article “On This Day: 4 June 1989” that the Chinese government would find objectionable. After censoring the article, students assess how censoring the information affects their understanding of the events and evaluate its impact on controlling information. How would you communicate your ideas as an artist if you could not leave your country? Due to Ai Weiwei’s political activism, the artist’s physical movements continue to be restricted by the Chinese government. 1/ Watch this newscast that details the background to Ai Weiwei’s music video, where reflects on his time spent in prison. Discuss student reactions to the video. Show students this second video interview recorded in Ai Weiwei Beijing studio on Oct. 9th, by Evan Osnos of The New Yorker. Here Mr. Ai explains what it is about communicating via the Internet that he finds “so beautiful”. 2/ Students create a classroom blog or website where they showcase some of the following creations where students respond to the question: What does freedom of expression mean to you? inspired by the themes of Ai Weiwei’s life/art. The rant should also reflects their knowledge of the Universal Declaration of Human Rights and their opinion(s) of the Chinese government’s violation of Ai’s rights. iMovie: Students script and perform a creative film inspired by the themes of Ai Weiwei’s life/art. The movie should also reflects their knowledge of the Universal Declaration of Human Rights and their opinion(s) of the Chinese government’s violation of Ai’s rights. 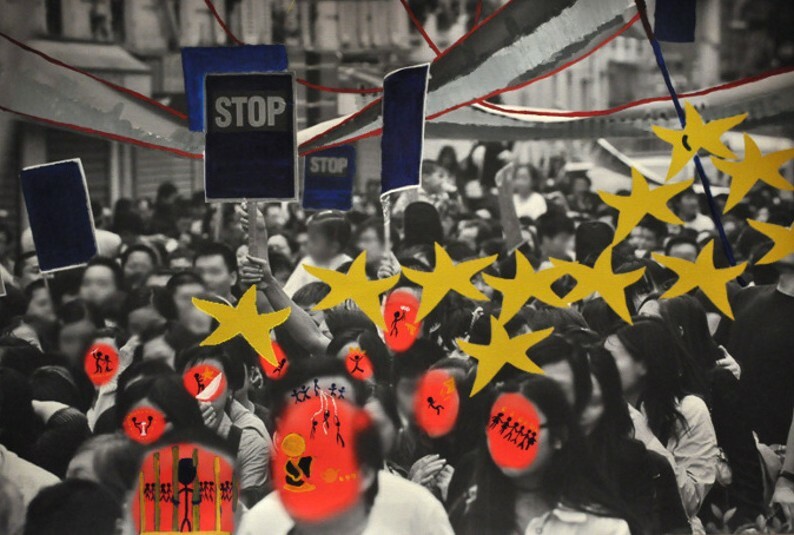 Artwork: Students create a work of art inspired by the themes of Ai Weiwei’s life/art. The work of art should also reflect their knowledge of the Universal Declaration of Human Rights and their opinion (s) of the Chinese government’s violation of Ai’s rights. This art might push against government authority by responding to censorship, a social justice issue and/or a human rights violation. Students will create a digital recording of the piece with an artist statement. For a comparative review of the strengths and weaknesses of these options; watch this video on a student’s perspective. • Fine Arts: How did Duchamp’s ready-mades, Warhol’s pop art, and Johns’ abstract expressionist paintings influence Ai Weiwei’s artwork? As a young man, Ai Weiwei moved to the US to attend the Parsons School of Design in New York City. He lived there for twelve years and discovered the artists who would become his main artistic influences: Marcel Duchamp, Andy Warhol, and Jasper Johns.